I’ve been obsessed with the design lineage of the Moulton bicycle ever since I got my first small wheeled folding bike: Bessie the Brompton. 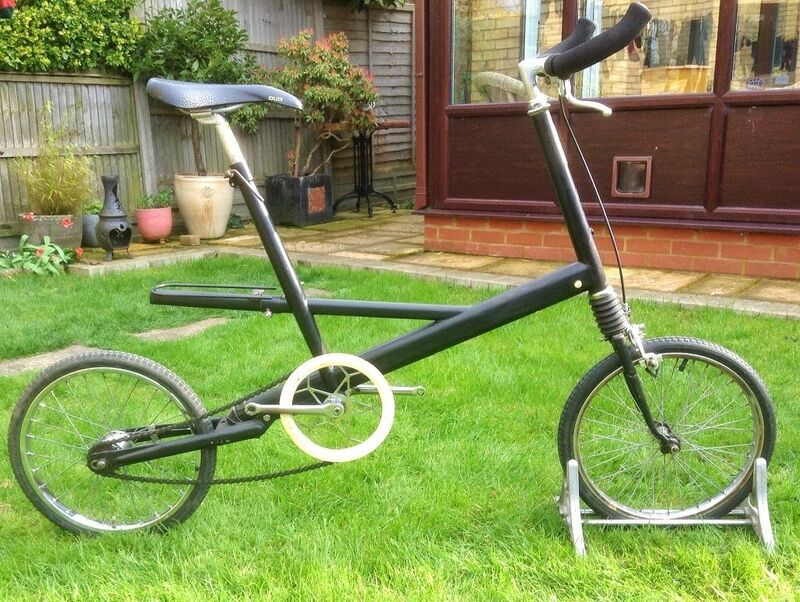 In mid-April 2017, a Moulton automatic appeared on eBay for 150 GBP with no bids and I decided I had to have it. I was the only bidder and minus another 60 GBP in shipping fees, it arrived at my doorstep from Stotfold, Bedfordshire. When the courier arrived with it the first thing I noticed was that it was quite long. I’ve read about the lengthy wheelbase, but exactly how long it was in-person was a shock to me. Picking it up revealed its weighty nature, and after a few short rides around the block, through the city center, and looping down by the University of Manchester, I decided in its current form it was not at all nimble like the Brompton. 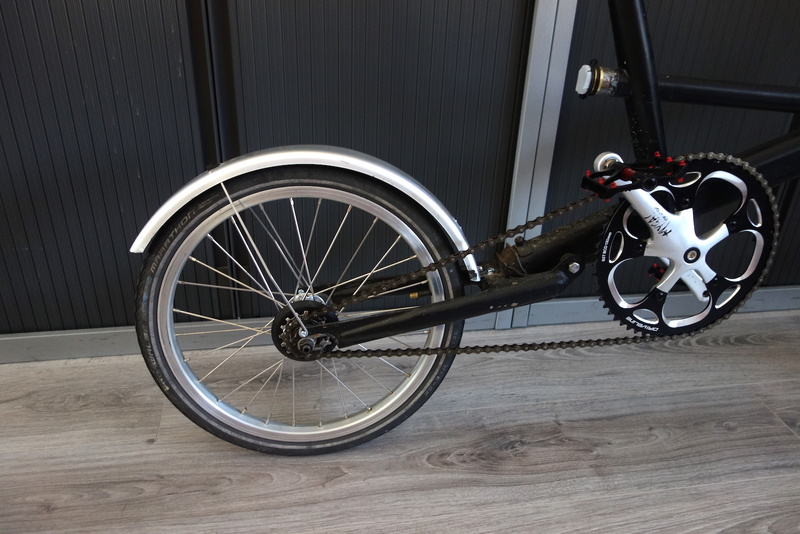 The resemblance was uncanny, however, and the ancestral design features which would land in the Brompton were all present: 16” x 1 3⁄4” wheels, rear suspension, and riding geometry. 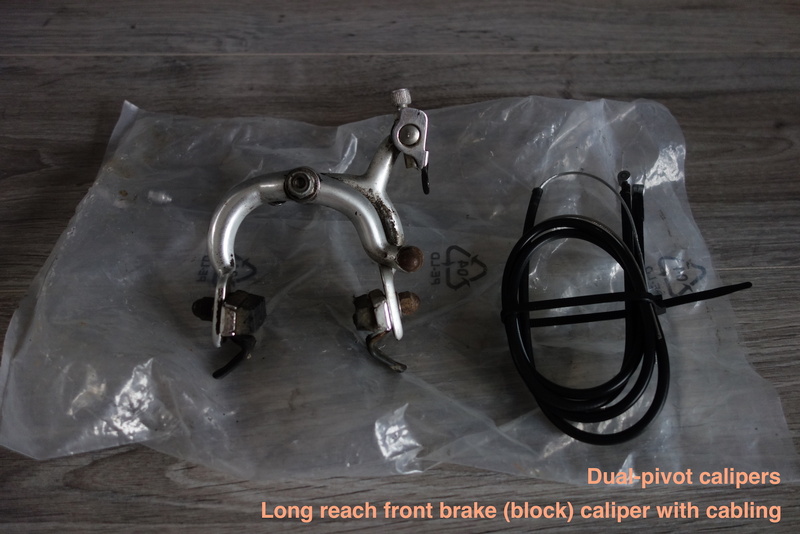 Its block brakes did not work well with the steel rims, and I knew this would be a problem in the wet if I was to use it in the wet environ of Manchester. Ultimately, the end goal was to have a high-gear ratio commuter that I could trust leaving locked up somewhere more than the Brompton. Though to make it more street worthy, its battered vintage parts would have to undergo some modernization. axle lock nut for the drive side. The overall braking, rolling resistance, and acceleration performance of the stock wheels was quite underpowered. 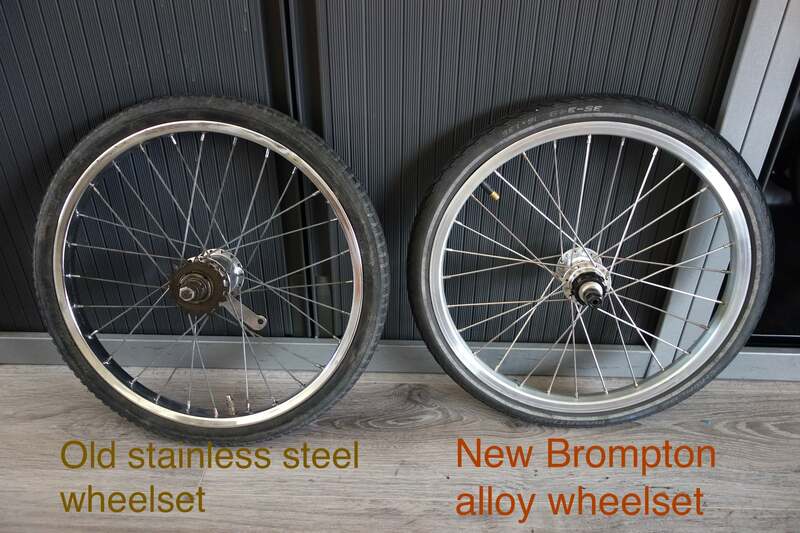 To improve this Brompton wheels would need to be sourced and refit onto the Moulton frame. The alloy rim surface along with modern dual pivot caliper brakes would not only be lighter, but also give back some control of the ride in wet conditions. 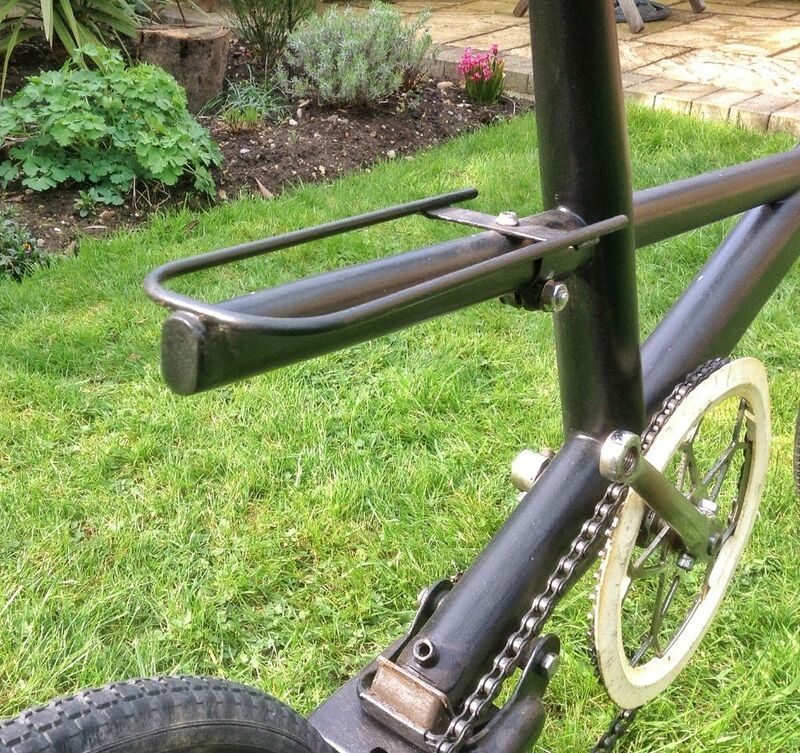 I opted for single speed build, with no rear brake, modern Brompton dual-pivot front. 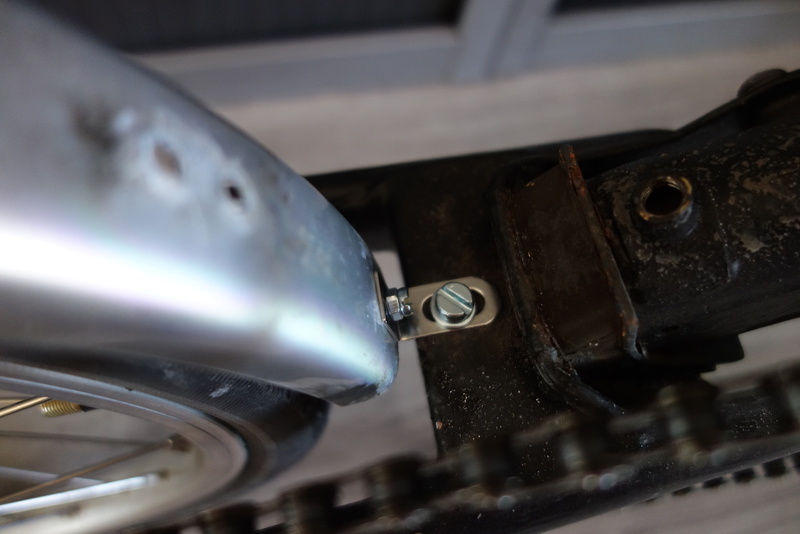 While the rear 2-speed Brompton wheel had more or less the same dropout measurements, the axle length and OLN width was radically different for front wheel. 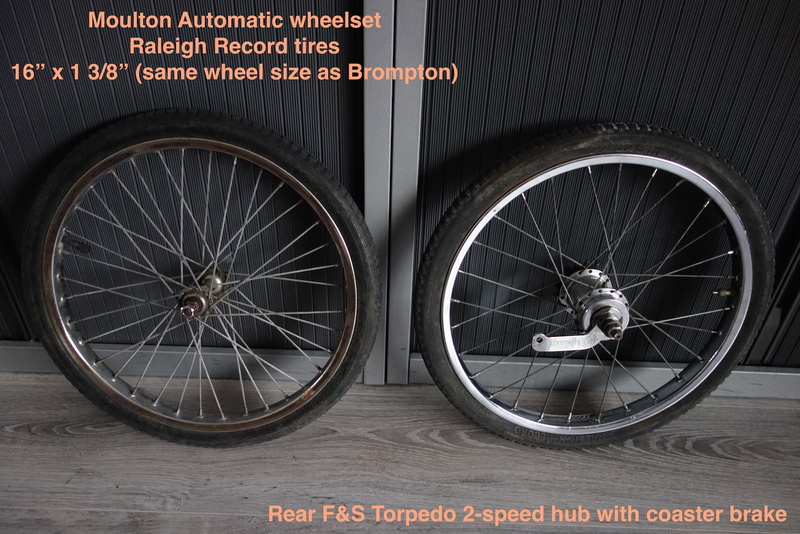 Weight was shaved by nearly 4 pounds by shedding the old wheelset for the retrofitted Brompton wheelset. 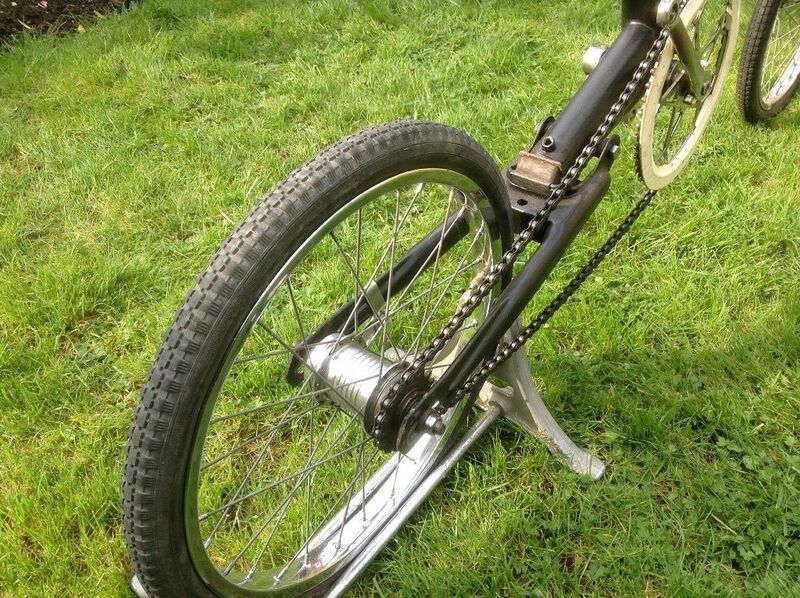 New axles came in a front and rear pair for about 9 GBP delivered. brake. 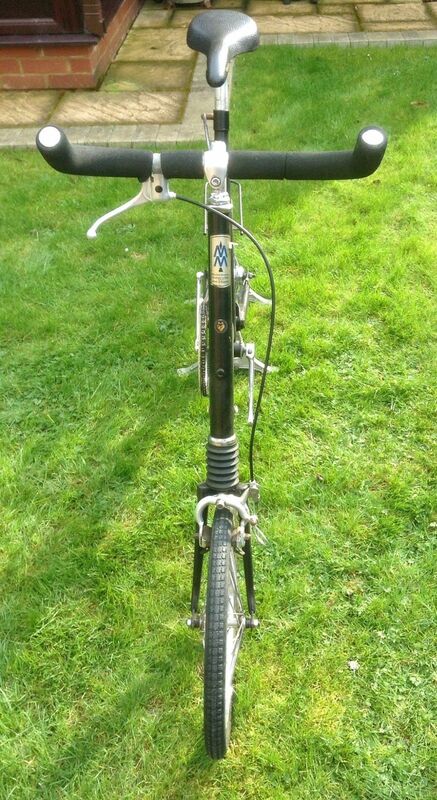 There was a mini-rack sold with the bike (manufactured from a Moulton seatpost downtube by John Bartlett), which was pretty but ultimately useless for carrying things, it had to come off. 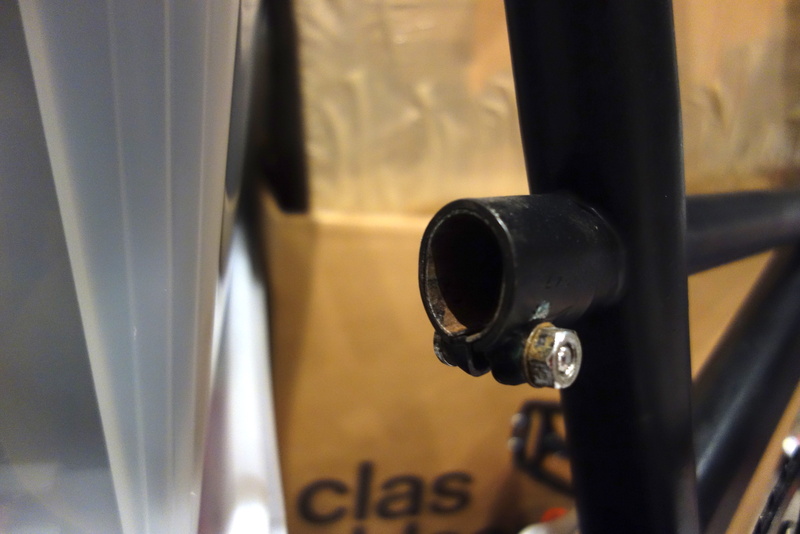 This left a gaping hole in the middle of the F frame that I plugged with a drilled out mudguard bracket and a reflector mount for a full-sized rack. 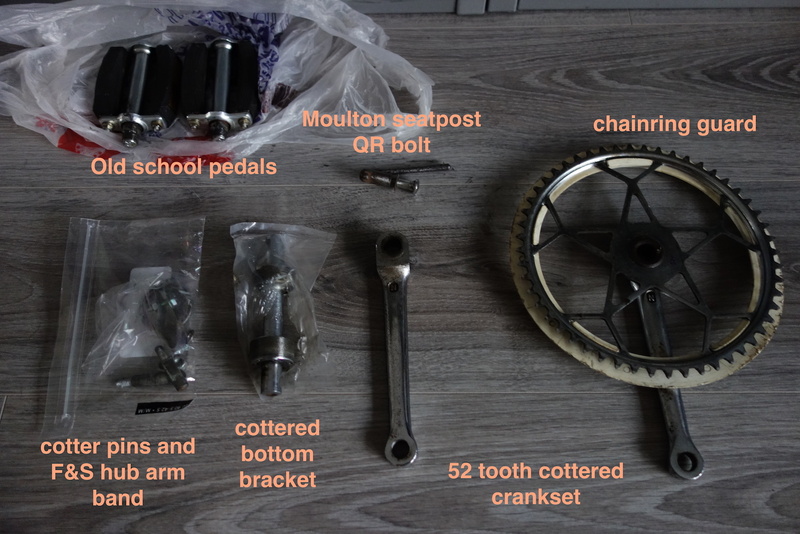 60 teeth front chainring fitted after cottered cranks and bottom bracket were removed and replaced with JIS square taper BB (shimano UN-51) Manganese lightweight pedals fitted to improve grip in wet: they held onto shoes with some steel studs. 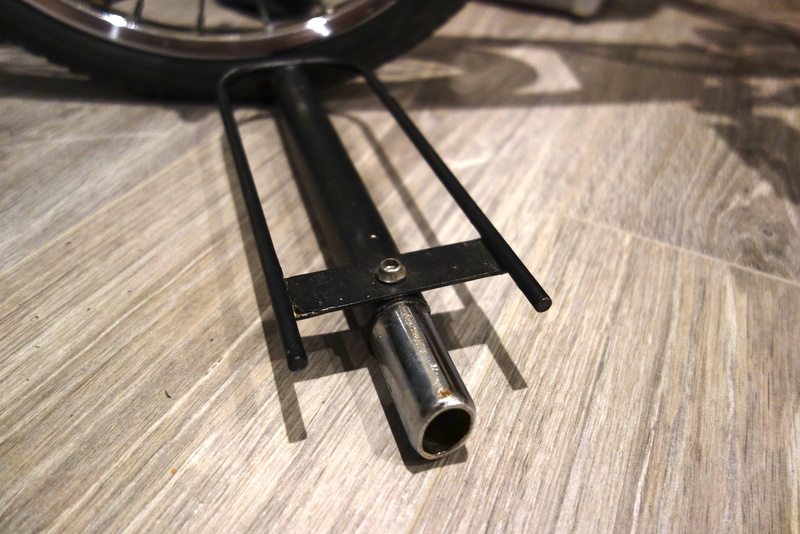 Brompton mudguards also fitted, and I had to drill out some of the rivets holding the stays to the guards to make them fit on the Moulton. 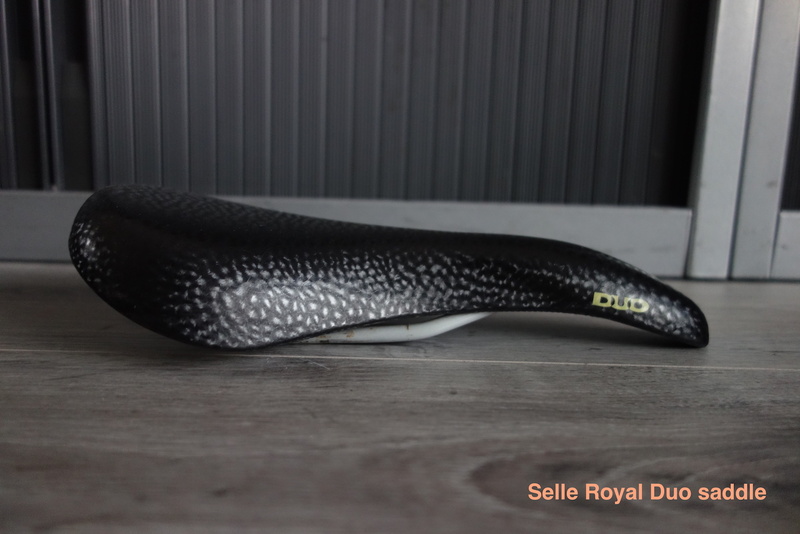 Saddle is a Selle Italia SLR 125g, a great saddle for the value. 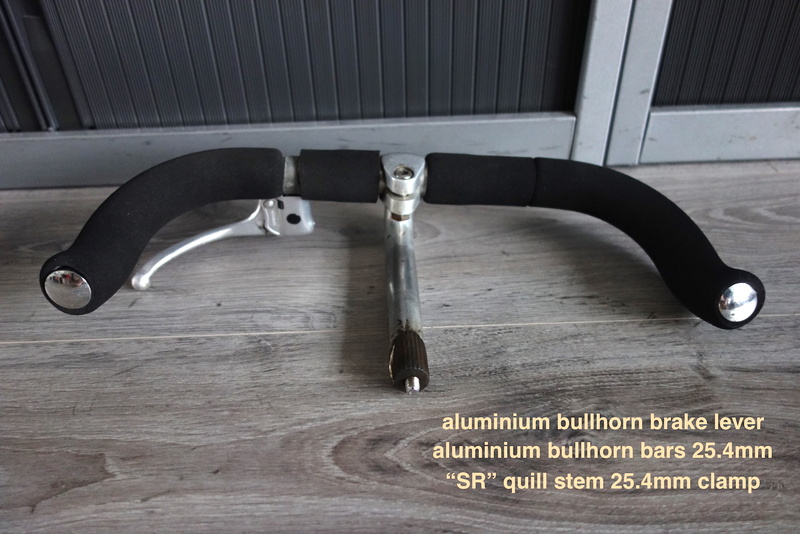 Carbon handlebars were also installed: 25.4mm with carbon bar ends, the length cut down from 580mm to 360mm (slightly less than shoulder width). 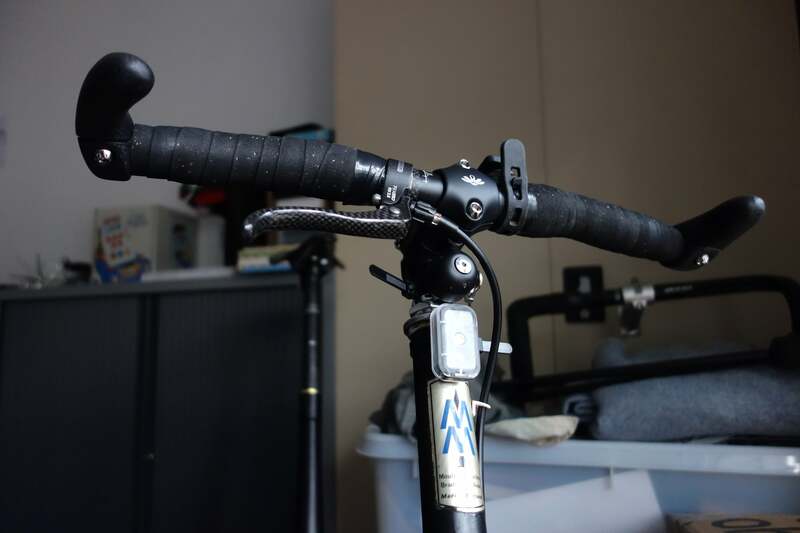 As a final improvement, Schwalbe Marathon+ tires where wrapped around both wheels to minimize punctures and maintenance. I’ve been riding this daily to and from work, it is both fast and nimble while handling like a full-sized (700c) bike due to its long wheelbase and full-suspension. Makes the commute a breeze, even in the rain! Total weight is approx. 12 kg. Somewhere just outside of Chorlton Water Park.